Former England and Chelsea defender Ashley Cole has said he will have to convince critics he has not joined LA Galaxy for an easy life. The 35-year-old turned down offers to join MLS clubs in 2014 and instead signed for Roma, saying he was "not ready to relax on a beach yet". 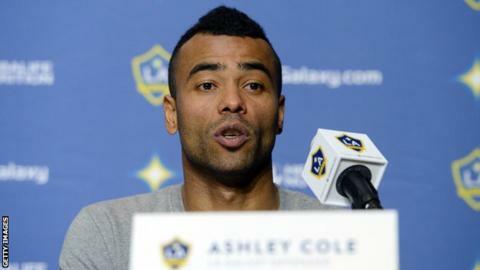 Cole, who joined Galaxy last week, said: "I hold my hands up, it was said, but it was taken out of context. "I have to deal with it and hope I can change the views of me coming here." Cole, capped 107 times by England, won three Premier League titles - two with Arsenal and one with Chelsea - and left the Blues to join Roma after the 2013-14 season. But he played just 16 times for the Serie A side before having his two-year deal cut short to join former Liverpool midfielder Steven Gerrard and ex-Tottenham striker Robbie Keane in Los Angeles. "I did find it, of course, difficult the last two years, not playing as much as I hoped and wanted to," he said. "Now it's a new challenge, a new venture for me. I've always been born to play hard and win things and I don't come here any different. "That's in my mindset, to come here and to win trophies."